The familiar Latin phrase, Per aspera ad astra, might describe Endfield's journey to their debut album. "Through hardships to the stars" or to their new album Right To The Top, mostly from personnel changes and inappropriate timing. 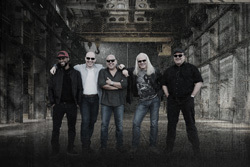 Formed in 2001 by vocalist Glyn Brookman and guitarist Sven "Doc" Hanke, both out of the band Practical Malfunction, Endfield started as a cover band. Some five years later new material was being written, resulting in the single Good Timing which was well-received. Now a quick fast forward ten years to the present and the band has gelled with solid crew and the new album Right To The Top. Largely, and to be succinct, Endfield plays melodic hard rock delivered in an AOR wrapper, a sound rooted in the classic Eighties tradition. The song arrangements are big on melody, vocal and guitar harmony, and a strong rock rhythm and groove. Vocalist Brookman has a strong vocal presence being clean, melodic, and sometimes with a deeper timber. The keyboards provide atmosphere, filling out the sound, often with a symphonic layer as with Girl In Flames and Pokerface, where you will also find a solo. For the songs, they range from the lighter pop AOR groove to more heavier rock numbers. For the former Good Timing, Next Mistake, Not Alone, and So Long fill the bill. I found that last song, So Long, perhaps the most interesting song of the entire album. The groove has a spirited bounce with Brookman and Doc Hanke, sounding like Mark Knopfler in voice and guitar, respectively. Indeed, So Long sounds like a Dire Straits song. More to the hard rock side of things come with the aforementioned Girl In Flames, the riff heavy Masterpiece Of Silence, and quick-paced riff roaring The Game, which features some rapping by some guy named Breezy. I don't listen to or really like rap music, so this addition really didn't do anything for me. Also, there's a ballad with the song Angel, featuring some sweet acoustic guitar lines, a soaring solo, and Brookman's passionate vocals. 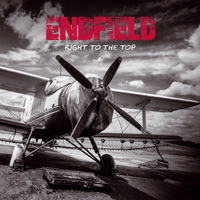 A long time in the making for Endfield, Right To The Top is a promising start for the band. To be honest, however, even with fine songwriting and good musicianship, I was only attracted to a few songs. That doesn't make the whole album bad, just not wholly compelling. But that's just me. Check it out, you may think differently. A long time in the making for Endfield, Right To The Top is a promising start for the band, and something you may find interesting, even entertaining.